Home » bottle » ecosystem » nature » plant » This Ecosystem has been waterd once in 40 years! 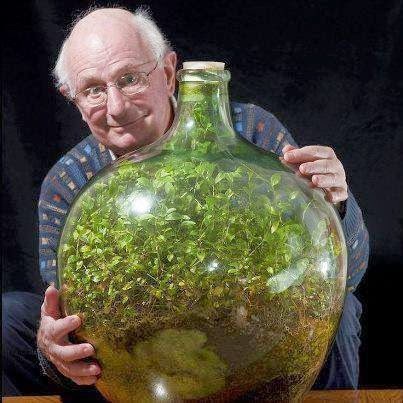 This miniature ecosystem has been thriving in an almost completely isolated state for over 40 years, in that time it has received water twice. In 1960, David Latimer planted this spiderwort plant by lowering a single seed by wire into a pile of compost and giving it a pint of water. In 1972, he gave it another pint of water and tightly sealed the carboy shut as an 'experiment'. Having access to light through the glass, it continues to photosynthesize. The water builds up on the inside of the bottle as condensation and then drips back down on the plants in a miniature version of the water cycle. As leaves die, they fall off and rot at the bottom producing the carbon dioxide and nutrients required for more plants to grow. It has occupied the same spot under his stairs in Cranleigh, Surrey for 27 years. He rotates it every now and then so it receives light evenly from a nearby window.